BRITISH STANDARD BS ISO/TR 3666:1998 Viscosity of water ICS 17.060BSISO/TR3666:1998 This British Standard, having been prepared under the directionof the Sector Committeefor Materials and Chemicals, was published under the authority of the Standards Committee and comes into effect on 15 March1999 © BSI 05-1999 ISBN 0 580 32297 1 National foreword This British Standard reproduces verbatim ISO/TR3666:1998 and implements it as the UK national standard. The UK participation in its preparation was entrusted to Technical Committee PTI/13, Petroleum testing and terminology, which has the responsibility to: — aid enquirers to understand the text; — present to the responsible international/European committee any enquiries on the interpretation, or proposals for change, and keep the UK interests informed; — monitor related international and European developments and promulgate them in the UK. A list of organizations represented on this committee can be obtained on request to its secretary. Cross-references The British Standards which implement international or European publications referred to in this document may be found in the BSI Standards Catalogue under the section entitled “International Standards Correspondence Index”, or by using the “Find” facility of the BSI Standards Electronic Catalogue. A British Standard does not purport to include all the necessary provisions of a contract. Users of British Standards are responsible for their correct application. Compliance with a British Standard does not of itself confer immunity from legal obligations. Summary of pages This document comprises a front cover, an inside front cover, pages i and ii, theISO/TR title page, page ii, pages 1 and 2 and a back cover. This standard has been updated (see copyright date) and may have had amendments incorporated. This will be indicated in the amendment table on the inside front cover. Amendments issued since publication Amd. No. Date CommentsBSISO/TR3666:1998 © BSI 05-1999 i Contents Page National foreword Inside front cover Foreword ii 1 Scope 1 2 Values for the viscosity of water 1 3 Realization of the viscosity of water 1 Annex A (informative) Results of water viscosity measurements 2 Annex B (informative) Bibliography 2 Table 1 — Recommended values for the (dynamic) viscosity ratio V r= ‰(T)/‰(20°C) of water at various reference temperatures; density  , temperature coefficients U ‰ , U v , and pressure coefficient * 1ii blankBSISO/TR3666:1998 ii © BSI 05-1999 Foreword ISO (the International Organization for Standardization) is a worldwide federation of national standards bodies (ISO member bodies). The work of preparing International Standards is normally carried out through ISO technical committees. Each member body interested in a subject for which a technical committee has been established has the right to be represented on that committee. International organizations, governmental and non-governmental, in liaison with ISO, also take part in the work. ISO collaborates closely with the International Electrotechnical Commission (IEC) on all matters of electrotechnical standardization. The main task of technical committees is to prepare International Standards, but in exceptional circumstances a technical committee may propose the publication of a Technical Report of one of the following types: — type 1, when the required support cannot be obtained for the publication of an International Standard, despite repeated efforts; — type 2, when the subject is still under technical development or where for any other reason there is the future but not immediate possibility of an agreement on an International Standard; — type 3, when a technical committee has collected data of a different kind from that which is normally published as an International Standard (“state of the art”, for example). Technical Reports of types1 and2 are subject to review within three years of publication, to decide whether they can be transformed into International Standards. Technical Reports of type3 do not necessarily have to be reviewed until the data they provide are considered to be no longer valid or useful. ISO/TR3666, which is a Technical Report of type3, was prepared by Technical Committee ISO/TC28, Petroleum products and lubricants. This second edition cancels and replaces the first edition (ISO/TR3666:1977), which has been technically revised. Annex A and Annex B of this Technical Report are for information only.BSISO/TR3666:1998 © BSI 05-1999 1 1 Scope This Technical Report gives values for the viscosity of water at several reference temperatures. The viscosity of water is commonly used throughout the world as the basis for the calibration of relative viscometers. 2 Values for the viscosity of water The dynamic viscosity, ‰, and the kinematic viscosity, v, of water at20°C and normal atmospheric pressure(0,101325 MPa) are given by: ‰ = 1,0016 mPa·s v = 1,003 4 mm 2 /s The estimated relative uncertainty associated with both values is0,17%, as detailed in Annex A. NOTE 1The viscosity values stated above are based on the value of1,0019mPa·s reported by Swindells et al. in1952 (seeAnnex B) which was also the basis of ISO/TR3666:1977 and corresponds to the IPTS-48 temperature scale. The change of this value by0,0003mPa·s is due to the difference of12mK between the IPTS-48 and the ITS-90 temperature scale at20°C. Based on a critical evaluation of the results of water viscosity measurements published between1949 and1994 (seeAnnex A), the temperature dependence of the viscosity of water, expressed by the viscosity ratio V r= ‰(T)/‰(20°C) for temperatures T between15°C and40°C, is given by the values listed in Table 1. For additional information the pressure coefficient,  , is given by the following equation. where The temperature coefficients U ‰ , and U vare given by equations2 and3. Uncertainties are stated as confidence interval at a95% confidence level. Temperatures are in accordance with the International Temperature Scale ITS-90. 3 Realization of the viscosity of water The viscosity values reported in this Technical Report refer to freshly double-distilled water. When using water for the calibration of viscometers, which are sensitive to surface tension effects (forexample capillary viscometers), special care has to be taken to avoid any contamination with surfactants. 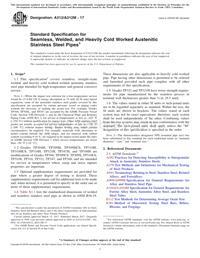 In this case it is recommended to use equipment made from fused silica for the distillation and storage of water. Table 1 — Recommended values for the (dynamic) viscosity ratio V r= ‰(T)/‰(20°C) of water at various reference temperatures; density  , temperature coefficients U ‰ , U v , and pressure coefficient   (1) p is the pressure, in megapascals. (2) (3) * = 1 ‰ --- · d‰ dp ------- U ‰ – 1 ‰ ---· d‰ dT -------- = U v – 1 v ---· dv dT -------- = Temperature, T Dynamic viscosity ratio, V r Density,   Temperature coefficient, U ‰ Temperature coefficient, U v Pressure coefficient,   °C kg/m 3 K –1 K –1 10 –4 MPa –1 15 1,136 0– 0,0006 999,10 0,0265 0,0264 –6,14 20 1,00000 998,20 0,0245 0,0243 –4,28 23 0,930 6– 0,0004 997,54 0,0235 0,0232 –3,28 25 0,8885– 0,000 3 997,04 0,0228 0,0225 –2,65 30 0,7958– 0,000 3 995,65 0,0213 0,0210 –1,22 40 0,6514– 0,000 2 992,21 0,018 8 0,018 5 +1,20BSISO/TR3666:1998 2 © BSI 05-1999 Annex A (informative) Results of water viscosity measurements It is current practice throughout the world to usethe viscosity of water at20°C and atmospheric pressure as the metrological basis of viscometry. Based on the value of ‰(20°C)=1,0019mPa·s aspublished by Swindells et al. in1952, the internationally accepted viscosity values of waterasstated in ISO/TR3666:1977 are ‰(20°C)=1,002mPa·s for dynamic viscosity and v(20°C)=1,0038mm 2 /s for kinematic viscosity, with an estimated uncertainty of0,25% for both values. From the present standpoint, these values require updating for the following reasons: a) according to the new International Temperature Scale, ITS-90, the viscosity value of1,002mPa·s, which was determined using the IPTS-48, is no longer valid for20,000°C, but applies to a temperature of19,988°C. The relative change in viscosity corresponding to this12mK temperature difference is3  10 –4and cannot be neglected with respect to a repeatability of1  10 –4which is achieved in precise measurements; b) besides the viscosity at20°C, reference values of high precision should be available in a wider temperature range, especially at23°C and25°C, which are frequently used as reference temperatures; c) it is inconsistent to state four valid digits for the dynamic viscosity and five for the kinematic viscosity while stating the same uncertainty for both; d) with regard to the present knowledge of the viscosity of water[1–6], the estimated uncertainty of0,25% is considered to be unrealistically high. Since the work of Swindells et al., four other absolute viscosity determinations, performed directly on water and using different methods, havebeen published[2 –5]. The uncertainties stated by the authors are not directly comparable with each other and also indicate the existance ofundetected systematic deviations. Therefore, intheabsence of other information, the unweighted average of all five results leads to a value of1,0020mPa·s– 0,0014 mPa·s. There are, however, strong reasons to consider the results of Swindells et al. and Berstad et al. to be more reliable than the other values. Since both results do not agree within the uncertainty stated by the authors, it does not seem appropriate to change the basic value (except for the adaption to the temperature scale changes) until new experimental results are available. In spite of this, the available information shows that the uncertainty of the water viscosity is less than0,25%. As an estimate, a value of0,17%, which covers all five experimental results, is considered as an adequate representation of the present knowledge of the viscosity of water. Annex B (informative) Bibliography  Swindells, J. F.; Coe, J. R.; Godfrey, T. B.: Absolute Viscosity of water at20°C. In: J. Res. NBS48 (1952), p.1 –31. 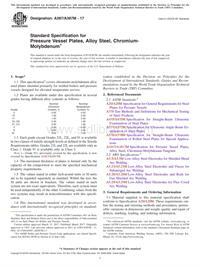 Roscoe, R.; Bainbridge, W.: Viscosity Determination by the Oscillating Vessel Method. II. The Viscosity of Water at20°C. In: Proc. Phys. Soc.72 (1958), p.585–595. Malyarov, G. A.: Opredelenie vyazkosti vody pri temperature20°C. (Determination of the viscosity of water at20°C.) In: Trudy Vses. Nauchno-Issled. Inst. Metrologii37 (1959), p.125–140. Kestin, J.; Shankland, J. R.: The Free Disk as an Absolute Viscometer and the Viscosity of Water in the Range25°C– 150°C. In: J. Non-Equil. Thermodyn.6 (1981), p.241–256. Berstad, D. A.; Knapstad, B.; Lamvik, M., Skj?lsvik, P.A., T?rklep, K. and ?ye, H.A. : Accurate Measurements of the Viscosity of Water in the Temperature Range19.5–25.5°C. In: Physica A151 (1988), p.246– 280. Bauer, H.; Binas, E.; Broeke, H.; Völkel, L.: Newrecommended viscosity values for water asthemetrological basis of viscometry. In: PTB-Mitteilungen105 (1995), p.99– 105.3 blankBS ISO/TR 3666:1998 BSI 389 Chiswick High Road London W4 4AL BSI—BritishStandardsInstitution BSI is the independent national body responsible for preparing BritishStandards. It presents the UK view on standards in Europe and at the international level. It is incorporated by Royal Charter. Revisions BritishStandards are updated by amendment or revision. Users of BritishStandards should make sure that they possess the latest amendments or editions. It is the constant aim of BSI to improve the quality of our products and services. We would be grateful if anyone finding an inaccuracy or ambiguity while using this BritishStandard would inform the Secretary of the technical committee responsible, the identity of which can be found on the inside front cover. Tel:02089969000. Fax:02089967400. BSI offers members an individual updating service called PLUS which ensures that subscribers automatically receive the latest editions of standards. Buying standards Orders for all BSI, international and foreign standards publications should be addressed to Customer Services. Tel:02089969001. Fax:02089967001. In response to orders for international standards, it is BSI policy to supply the BSI implementation of those that have been published as BritishStandards, unless otherwise requested. Information on standards BSI provides a wide range of information on national, European and international standards through its Library and its Technical Help to Exporters Service. Various BSI electronic information services are also available which give details on all its products and services. Contact the Information Centre. Tel:02089967111. Fax:02089967048. Subscribing members of BSI are kept up to date with standards developments and receive substantial discounts on the purchase price of standards. For details of these and other benefits contact Membership Administration. Tel:02089967002. Fax:02089967001. Copyright Copyright subsists in all BSI publications. BSI also holds the copyright, in the UK, of the publications of the internationalstandardization bodies. Except as permitted under the Copyright, Designs and Patents Act 1988 no extract may be reproduced, stored in a retrieval system or transmitted in any form or by any means – electronic, photocopying, recording or otherwise – without prior written permission from BSI. This does not preclude the free use, in the course of implementing the standard, of necessary details such as symbols, and size, type or grade designations. If these details are to be used for any other purpose than implementation then the prior written permission of BSI must be obtained. If permission is granted, the terms may include royalty payments or a licensing agreement. Details and advice can be obtained from the Copyright Manager. Tel:02089967070.